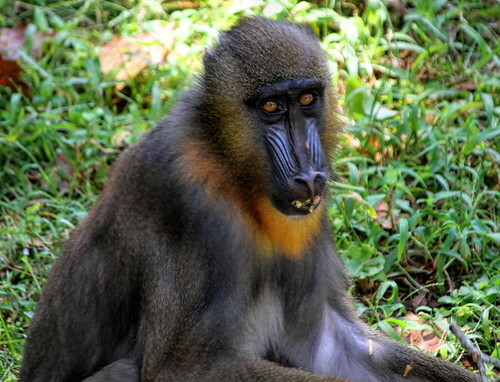 The mandrill (Mandrillus sphinx) is a primate of the Old World monkey (Cercopithecidae) family, closely related to the baboons and even more closely to the drill. It is found in southern Cameroon, Gabon, Equatorial Guinea, and Congo. Mandrills mostly live in tropical rainforests and forest-savanna mosaics. They live in groups called hordes. Mandrills have an omnivorous diet consisting mostly of fruits and insects.